Archbishop John Francis Donoghue broke ground on January 29, 1999, for the construction of Blessed Trinity. The architects for the school were Hussey, Gay, Bell and DeYoung International, Inc. of Savannah, and the general contractor was Batson-Cook Co. of Atlanta. Allen Kronenberger of Catholic Construction Services was the project manager. The founding principal was Frank Moore. The school opened in August 2000 with a 3-year initial accreditation from the Southern Association of Colleges and Schools (SACS) and with an enrollment of 164 freshmen and 55 sophomores. The initial faculty and staff consisted of 35 employees. The 2001-2002 school year began with 465 students in the 9th, 10th and 11th grades. The faculty and staff grew to 58. The number of course offerings more than doubled to 76, including the first AP courses – English Language, World History, United States History, and Chemistry. Band was added to the fine arts offerings of visual art, vocal music and dance. Wrestling and swimming were added to the athletic offerings. For the 2002-2003 school year, the student population grew to 680 and the faculty and staff to 83. Courses offered grew to 115 and five AP courses were added – English Literature, Psychology, Calculus AB, Spanish Language, and Studio Art. Drama was added to fine arts, and all athletic teams competed at the varsity level in Classification AA. The school completed its first self-study in April 2003 and was awarded a 5-year full accreditation by SACS. In May 2003, the girls' golf team won the school's first state championship. The first graduation took place on May 24, 2003, in the school theater. The 2003-2004 school year opened with 850 students and a faculty and staff of 100. The course catalog grew to over 130 courses and AP courses were added in Government, Macroeconomics, Biology and French Language. Lights were erected on the soccer field, and the wall separating two small weight rooms next to the auxiliary gym was removed and the space converted into a wrestling room and training room. In October 2003, the boys' cross country team brought home the first state championship in a boys sport. In the spring of 2004, the girls' golf, tennis, and soccer teams all won state championships. Blessed Trinity's athletic program was awarded the Georgia Athletic Directors Association Director's Cup as the most successful overall AA program in the state. With the student population and employee base having leveled off, the school opened the 2004-2005 year in Classification AAA and prepared to do its first strategic long range plan. A 25-person committee supervised the surveying of parents, faculty, and students. The course offerings increased to over 140 and AP Statistics was added to the Advanced Placement offerings. Lights were added to the baseball field, and a lacrosse field was created next to the football stadium. Boys and girls lacrosse and competition cheerleading were added to the varsity athletic program, bringing the total number of varsity teams to 22. In 2005-2006, the strategic long range plan was completed in December. The number of course offerings reached 149. AP Calculus BC and AP Art History were added to the AP lineup. The girls' cross country, girls' soccer, and baseball teams all brought home state championships. In 2006-2007, the AP program grew once again to include AP Environmental Science and AP Computer Science. The school began the process to earn dual accreditation with SACS and the Southern Association of Independent Schools (SAIS). Visitors' bleachers were added to the football stadium. The volleyball and girls' cross country teams won state championships. In 2007-2008, the school completed an 18-month self study and was awarded dual accreditation by the Southern Association of Independent Schools (SAIS) and the Southern Association of Colleges and Schools (SACS). To increase student involvement in the school, a house system was begun, with all students randomly placed into one of eight houses and within each house, into one of five family groups. The AP Program added AP Physics C: Mechanics and AP Music Theory to the lineup. The field house adjoining the football stadium was increased in size by over 60%, with larger locker rooms and weight room, a training room, film room, and coaches’ offices. The softball and girls’ soccer teams brought home the school’s 13th and 14th state championships. For the third time, Blessed Trinity’s athletic program was awarded the Georgia Athletic Directors Association Girls’ Sports Director’s Cup as the most successful girls AAA program in the state. In 2008-2009, decks were constructed around the announcer’s box on the softball and baseball fields, and a brick wall was built from dugout to dugout on the baseball field, with new netting added. The Academic Team, Girls Golf, and Girls Tennis all won state championships. For the second time, Blessed Trinity’s athletic program was awarded the Georgia Athletic Directors Association All-Sports Director’s Cup as the most successful overall AA program in the state. In 2009-2010, a brick wall was built around the softball field to match the baseball field. The Advanced Placement Program grew with the addition of AP Human Geography, the first AP course offered to freshmen. The boys and girls tennis teams both won the state championship. In 2010-2011, plans were finalized for the school’s first major capital campaign to improve athletic and fine arts facilities and to increase the endowment. Enrollment jumped by 70 students to 935. Volleyball, girls tennis, and girls soccer won the state championship. In 2011-2012, the process was begun to renew the SAIS/SACS dual accreditation, and the “This Is Our Moment” Capital Campaign was launched. Enrollment increased to 960 students, and AP Latin was added to the curriculum. The girls tennis team won the state championship. In 2012-2013, the school was awarded dual accreditation by SAIS/SACS, and the 18 schools of the Archdiocese of Atlanta, was awarded system accreditation by AdvancED. The capital campaign raised the funds to install artificial turf on the lower field, which became the new home of lacrosse, and on the baseball field. The volleyball, boys tennis, and girls tennis teams won the state championship. In 2013-2014, the capital campaign funded the artificial turf on the main stadium field, which became the home of soccer as well as football. Security improvements in the building included sealing off the cafeteria from the lobby and increasing the number of doors that could only be activated with an electronic key. An additional classroom was created from excess space in the Media Center and a large storage room was converted to a Robotics Team room. The girls cross country, girls tennis, girls golf, and baseball teams won the state championship. 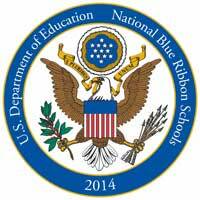 In 2014-2015, Blessed Trinity was named a National Blue Ribbon School of Excellence by the U.S. Department of Education. To test the ability of the school’s technological infrastructure and the teachers and students comfort level with online teaching, two “virtual school days” were conducted in October, with the teachers in the building and the students “attending” all classes at home. The decision was made later in the year to become a Chromebook school in the fall of 2015. The four-year capital campaign concluded. With the three fields turfed, attention went to the construction of the Fine Arts Annex. The design of the building was completed. Additional bleachers and a new press box were added to the football/soccer stadium, bringing the seating into compliance with GHSA guidelines. In athletics, the school brought home a record five state championships: volleyball, boys cross country, girls tennis, boys golf, and baseball. For the fourth time, Blessed Trinity’s athletic program was awarded the Georgia Athletic Directors Association Girls’ Sports Director’s Cup as the most successful girls AAA program in the state.